"Just left the hospital and it is worse than I thought. My good friend is in the hospital in Abuja now for four days with second degree burns. 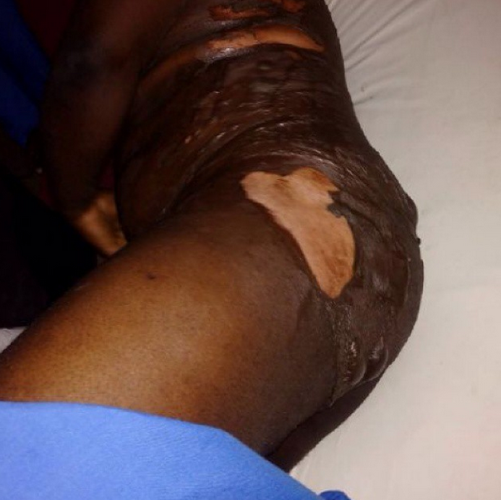 While he was sleeping his wife poured hot water on him (face legs, thighs, hips). She then locked him inside while he was screaming "fire, fire", then she took off. She is 5months pregnant they have a 16month old. Been married for a year and a half. Early in the year, she slapped him which lead to him beating her. They reconciled. He also complains that they switch house-help every month because she beats the househelp where there is blood on the wall. Should he stay or get the f out! !...- pissed off friend"